At high frequency, when the wavelength is small compared to the object size, then the sound does not diffract very effectively. In acoustics, we use the term shadow zone to describe the area behind the object, because if you stand there, you are in an acoustic shadow (just like the optical shadows we see) and the sound is quieter than elsewhere. This is exploited in acoustics to reduce noise levels. For instance, noise barriers can be put up alongside major roads – houses behind the barriers are exposed to less noise if they are in the shadow zone. But remember – low frequencies are unaffected by the barriers and can diffract over the top. 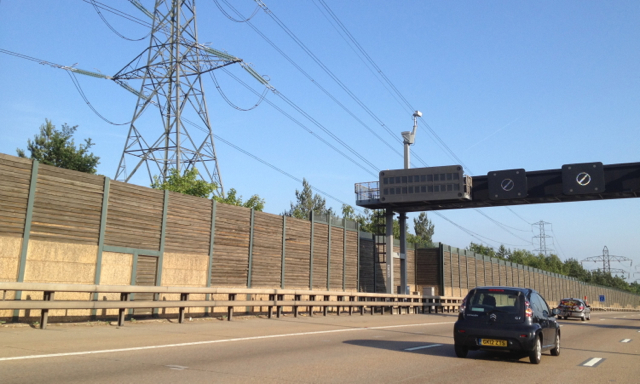 Look out for heavily-built fences along the side of motorways in built-up areas – these are noise barriers. Sometimes the barriers are made of earth, in which case they’re called a bund (really, they are!). A really good example of diffraction can be seen with another type of wave barrier – a harbour or dock wall. If you live near the sea, have a look at waves on a windy day hitting a harbour wall. Some of the energy will reflect, but at the end of the barrier (near the opening of the harbour) the waves will bend around and come inside. If the water inside the harbour stayed dead calm, then somewhere near the harbour mouth you would see completely flat water immediately next to big waves. This can’t happen, some of the waves must get into the flat water. This is another way of picturing the bending that diffraction describes. Going back to acoustics – you might want to avoid this shadowing effect when you go to see a band or orchestra play. 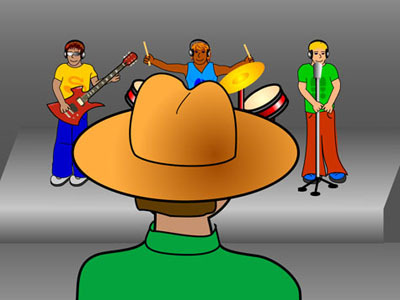 If you’re behind someone tall, then not only do you not get to see the musicians, you also get less direct sound from the stage because it has to diffract around the head in front. Seats in a theatre or stadium are on a slope, not only because it gives you a good line of sight, but also because it improves the sound quality. Light waves have a very small wavelength (typically 500 nm, although of course it changes with colour) and diffract noticeably in everyday life. We can set up specialised experiments in the lab to demonstrate light diffraction, but if you’re in the shadows on a sunny day, diffraction around the obstruction to the direct sunlight is not going to get you a tan. We’ve been using sound as an example since it has a much longer wavelength (from a few centimetres to a few metres depending on the frequency) and so objects such as the edges of walls will cause diffraction and enable sound to travel round corners. Diffraction also plays an important role in allowing us to locate sources of sound. If you close your eyes, you can tell which direction sound is coming from. How does this work? When sound reaches you from straight ahead, the same sound signal is received at both ears. This is because the head is more-or-less symmetrical and the sound to both ears travels an identical path. Your brain uses this information to locate the sound in front of you. When sound comes from the side (directly, or via a reflection as shown above), the sound at each ear is different. 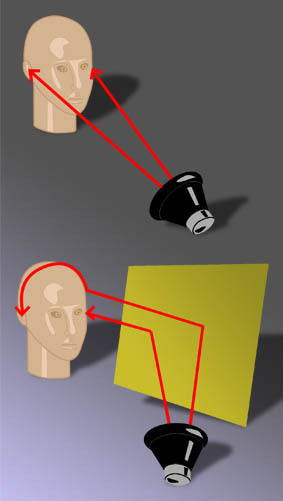 Sound to the furthest ear has to diffract (bend) around the head. This means the sound wave arrives slightly later and is altered in terms of the balance of high and low frequencies it contains (we could call this a spectral alteration). As we have seen, sounds with short wavelength (high frequency) don’t diffract as well, so the furthest ear hears fewer high frequencies. The brain senses this difference in arrival time and frequency content, and uses it to locate sound. So we have two ears because it allows us to locate sound. The is very important for use to be able to track prey and to prevent us getting attacked. Our eyes face front, so it is really important that are ears are very good at hearing things and working our where the sound is coming from. Recreating a sense of where sound comes from is vital for virtual reality. 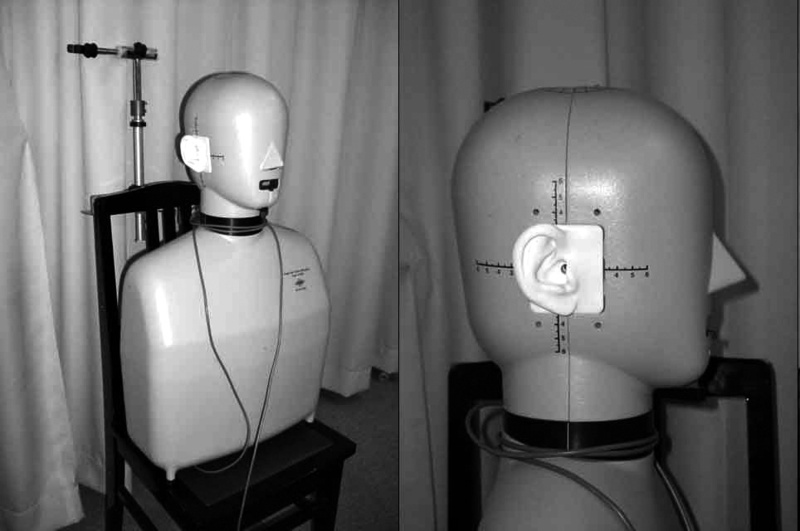 One way to achieve this is to record sound in binaural using a dummy head with microphones in the ears. This means the sound recorded has all the cues for location captured, including the effects of diffraction. Play a binaural recording over headphones, and you hear the sounds surround you like in real life. Diffraction also affects the way in which electromagnetic (radio) waves are broadcast and received for radio and TV signals. TV and VHF radio signals have wavelengths of around a few metres. This means they cannot diffract over hills or large buildings. The receiver must be in direct line-of-sight with the transmitter. Repeater stations are often positioned at the top of hills to reach all the houses in the valley that would otherwise be in the shadow of the hill. Long-wave radio is sent using waves with a much larger wavelength of around 1km. This means they can diffract around objects including hills and buildings. They can reach places that short-wave radio cannot. This is why it is often possible to listen to long wave radio stations such as radio 4, even when FM reception is poor. It’s also why stations on long wave (BBC Radio 4 – 198LW) are tuned to the same frequency wherever you go – there’s only one transmitter for the whole of England, Wales and Ireland (in Droitwich). By contrast, FM transmitters only cover a small region. This limited coverage is why you have to continually re-tune a car radio when listening to FM on a long journey. Although if you have an ‘rds’ radio, it does this for you. Question: Why can’t BBC Radio 1 be broadcast on 98.9 FM over the whole country, using a large number of local transmitters all tuned to the same frequency? (Hint – think about superposition, and constructive and destructive interference).